NASHVILLE, TN (April 18, 2011)  A spring ritual got underway today when officials from Macy's Thanksgiving Day Parade visited Father Ryan H.S. in Nashville to announce that its band has been selected to march in the 2012 spectacle in New York City. Father Ryan is the first band announced for a lineup that is expected to include 11 marching bands from across the country. 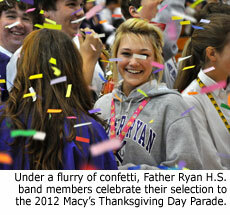 The selection was revealed at Father Ryan H.S. during an assembly that had been organized to honor co-director Jeff Schletzer for his 30 years of service to the band. The entire student body was on hand, and when the Macy's selection was announced, students gave band members a standing ovation for bringing the coveted honor to their school. 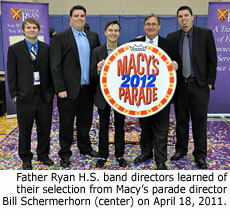 Schletzer was thrilled that Macy's reserved a spot for the Father Ryan Band, which has averaged 85 to 90 members in recent years. "I was honored and surprised, because they typically select larger groups," Schletzer said. "I really appreciate that they noticed us. This has been a life-long dream for me." The band's quality was more important than its size, according to Macy's associate creative director Wesley Whatley who oversees the selection process. "Father Ryan is the smallest band we selected for 2012, but their execution and imagination on the field far exceed other bands who were perhaps larger in number," Whatley said. "The Macy's Band Selection Committee is open to groups of all sizes and when we saw Father Ryan's application, we knew they would well represent bands who are small in number but know how to put on a big, exciting show." Parade director Bill Schermerhorn, who delivered the announcement, noted that Father Ryan is a good fit for the variety the parade seeks each year. "We are an entertainment program and we want bands of all different styles," Schermerhorn said. "I'm thrilled Father Ryan is going to represent Tennessee in 2012. It all starts with music, and they sound great. When you combine that sound with the creativity behind their drill routine, Father Ryan was an easy selection to make." Macy's announces its selections more than a year in advance to give bands time to raise funds and to create a show that will be performed for more than 50 million viewers during the NBC television broadcast. Schermerhorn has been involved with the parade for 27 years, and he describes the process as "a well-oiled machine." "From this point on, we will be in constant touch with the band directors," Schermerhorn said. "The directors will join us in New York in October 2012 when we will take them on a tour of the parade route and go through the whole process. We will see a video of the routine they have planned and we will offer comments and suggestions to possibly enhance the routine in some way. When they come back on the Tuesday before Thanksgiving, they will be totally prepared for the parade." The 2012 Macy's Thanksgiving Day Parade will be held Thursday, November 22, 2012. Additional band participants will be announced throughout the spring, and those bands will be posted regularly on the Macy's Thanksgiving Day Parade event profile on Marching.com.